I’m such an awesome dancer. At least hip-hop wise, I'm hard to beat ... in my perhaps overconfident mind. watch Princess Dannika + King Richard's dance-off! But salsa is a different beast for me. The rhythm, which clearly I have such an innate understanding for in hip-hop (again, referencing video) in salsa, I find much more complicated. Furthermore, you can't dance salsa by yourself. One doesn't look cool on the dance floor spinning an imaginary partner. Not to mention, I have a weird gene preventing me from asking someone in a salsa club to dance. Oh no, it's not because I feel self-conscious, hardly, it's because in any interaction, I desire to leave the other party better off then when I arrived; it's the key to my success and happiness. I feel so lacking in the salsa department, I believe myself to be a burden for any partner, and thus don't wish to force myself upon them. Which is why when I arrived in Medellin and heard that there was a salsa studio very close to my accommodations, I jumped at the opportunity. Like anything it's frustrating at first, but I found myself improving, ever "slightly." And my teacher, for my second class, Maria, I absolutely fell in love with. She's beautiful, kind, fun, and of course, a great dancer. I left her flowers when I was leaving the city. She wasn't there to receive them, but again, she was so awesome, and even though I paid for the classes, I still wanted to leave her better off, and my goal was that she feel appreciated, and smile big. 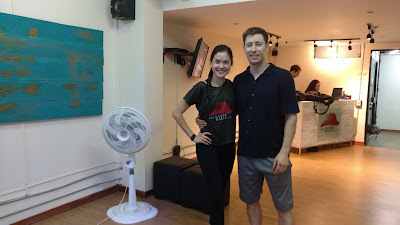 So you can see, the below video contains 2 minutes of my second class at Santo Baile with Maria. There was definite improvement from my first class. If you are looking to learn how to dance any South American style, I would highly recommend the studio. If you want to learn hip-hop, then by all means, Rich's classes have vacancies. Your spirit and energy are wonderful here! Safe to say you enjoyed Medellin more than Bogota? Hi Amanda, thanks for your comment, YES, I definitely enjoyed Medellin MUCH more than Bogota. If you go to Colombia, SKIP Bogota!